Where: Loveland Ski Area on 11/17/07. Conditions at Loveland: 100% groomed manmade snow. Partly cloudy with flurries, 20F at dawn, 30F at 3PM. My specs: 5? 11", 235lbs. 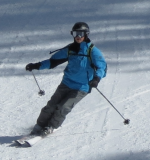 male, 40th season skiing, former USSA & High School 7-day-a-week competitor in New Hampshire, GS & DH specialist. Skis used in the last 2 years: Dynastar Contact 11, Fischer RX8, WC SC & WC RC, Volkl AC4 & Mantra, Head Monster 77 & 88, Dynastar Inspired by Nobis, several others? Monster i78M, 171cm 124-78-110mm, 14.6 meter TR @ 171cm. This was the first ski of the day and a ski a really wanted to try. Unfortunately they only had the 171cm available in inventory; I should use the next size up. I spent several runs on the ski and really enjoyed its all-around performance and ease-of-use. The ski was very willing to perform medium radius turns with total confidence. Tight turns could also be had, with a little finesse. The ski felt stable but lacked solid edge-grip on faster GS turns, I?m sure the longer ski would have been better for me on faster turns. The i78M actually felt easier than the Monster i77M which it replaces. The tail is stiff, but not as stiff as the i77M; so the ski is a little more forgiving while outperforming the i77M in every way. The i78M is a great all-around ski for a wide range of all-mountain skiers from intermediate to expert skill level. Head iXRC 1200, 170cm 115-68-101mm, 14.3 meter TR @ 170cm. This is the sandwich construction iXRC 1200. The ski felt much faster edge-to-edge than the Monster i78M. I followed a young racer on SL skis and I could duplicate his quick edge changes. The iXRC also felt very good at higher recreation speeds, a surprise for a ski this short. As before, Head did not have a size longer than a 170cm, but this ski felt more stable at higher carving speeds than the i78M. It did not feel super solid in choppy snow at higher speeds and was not the kind of stable GS fall-line burner, a step below some other skis I have used. Again the longer ski might have performed better for me. An easy-to-use hard-snow groomer-cruiser, but not a substitute for a race ski. This is a ski I really want to own. I?ve owned the WC RC, WC SC, RX8 & Scenio S500, so, I?m a bit of a Fischer fanatic. The ski did not disappoint. The ski felt stable and fast like the RC & Scenio. I was a little surprised, I was expecting a SL/GS hybrid, but this was not the case. This ski likes speed and fall-line skiing and feels better the faster you go. I then started working the ski and could make high-C shaped turns with excellent turn in, so the ski is an improvement on the RC and offers better turn shape variety. It also feels very stable at GS speeds, the ski will humble the skier and demand faster & tighter turns with huge g-forces. It would take me a few runs to get expert level results, but this ski will provide hero level performance. A V12 Ferrari that will deliver huge performance under the feet of a great skier or former racer. Fischer has greatly expanded the mid-fat and wider skis offerings. The Watea series is aimed at the weekend warrior who is seeking a high performance ski that is versatile and easy to use. The Watea 94 is a great ski for groomers. It should also perform well in soft & deep snow, but these conditions were not present. The typical delay in turn initiation exists; this is not a skinny ski. The delay from edge-to-edge can be mitigated by higher speeds and increased edge angle, any good skier should find the ski easy-to-use. The ski carves very well. It will produce high C turns very easily and can make any turn shape except tight SL turns. It also is cooperative at a most speeds, including very fast GS type skiing. I would be very happy with this ski. It felt like a 94mm wide RX8. The Watea 94 provides high performance from moderate effort. A fat ski for a wide range of good skiers that will be come as well regarded as the RX8. Almost all my comments concerning the Fischer Progressor could be cut-n-pasted to describe this ski. It?s a real performance ski and probably the top on-piste performer in the Nordica line. This is my first time for me on a Nordica and I liked the feel of the ski immediately. The ski feels very quick edge-to-edge, almost ?light? feeling. But at higher speeds it is ultra stable with huge edge-grip. The Power version has plenty of metal and race ski construction; it?s an expert ski in every way. It likes fall line GS turns the most, Medium radius turns requires race level skills with high edge angles. It should also be stable in crud with the 72mm wide waist. I was expecting a versatile carving/ all-mountain ski, but the Mach 3 power is something else. It?s an on-piste ski for former racers. The Nordica Mach 3 Power is a great performance ski for top level skiers. Quick, stable, powerful; this is a high end ski for those with the right skills; others should consider the Mach 3 Carbon. The Elan 888 is a high performance mid-fat for strong skiers. The ski has a deep side-cut, so I was expecting an easy-to-use mid-fat for the masses. The ski is better suited to top level skiers who already have great skills and like speed. The ski was quick edge-to-edge with a GS ski performance & attitude. It really likes to run down the fall line at higher speeds. It has a very smooth and reliable feel, like nothing will cause it to fail. I was eventually able to finesse some mid length turns, but it required added edge angle and an aggressive, high energy skiing style. I?m sure the ski is a bomber in crud. The Elan 888 Alu is for strong skiers who stay close to the fall line & like to rip. This Head carver is a well balanced design and could be used on-piste by bigger & faster skiers even in the 170cm size. This is the black ski with the Chip technology and the sidecut as listed above. The ski likes to make hi-edge-angle carved turns and in nimble enough for SL turns and quick enough for moguls. It also will remain stable during faster GS style turns. I enjoyed the ski as a versatile on piste carver. It?s not a potential race ski and is not the best ski (in this size) for super-fast skiing, but it is a great ski for ?Vermont? type conditions and terrain. The Chip Supershape is a great ski for technical skiers looking for performance & versatility in a quick and stable package. The Cold heat uses the laminate with vertical sidewall construction with the carving Flowflex plate. The feel of the ski is much more carving oriented than the Watea, and is intended for on-piste use primarily. The ski performs well, it is easier than the Progressor and more versatile. It does not require full-time attention and should ski well in softer snow. I could see this ski in Vermont as a one-ski-quiver or as a western ski for skiers who stay on groomed runs 90% of the time. With excellent carving performance and a user friendly personality, the Cold Heat supports technical development and high performance skiing. Today the longer ski was available and what a difference the right size makes. My impression of the 184cm size was outstanding. Fun, fun, fun, very versatile and high performing. It produced short and medium turns easily and felt much smaller than its 184cm size. The longer length provided plenty of edge-grip and stability on longer turns. This ski was very willing and able to carve any kind of turn at any sane speed; it also required minimal effort while providing thrilling performance. The Watia 84 is an easy to use and reliable all-mountain tool for a wide range of skiers, but use it in a longer size than you would other carving mid-fats. The Mythic Rider replaces the 8800 as the all-mountain ski in the Dynastar line-up. The ski has more shape and has been strengthened in the mid-section and fore-body of the ski, according to the local Rep. The ski actually feels easier-to-use than the 8800 with good turn-in and the ability to produce High C shaped turns. This ski is more docile than the other fat skis I used this weekend, it does not urge the skier to plunge down the fall-line like the Elan 888 for example. However, like every ski used this weekend, it?s an advancement over prior generation skis of this size and will support all-mountain skiing to a wide range of skiers. The Mythic Rider provides a wide performance range from intermediate to expert level. It?s a ski that the skier easily controls and can be taken anywhere on the mountain. The Speedwave 14 uses every technical feature in the Elan product line. It has dual Titanium like the WC skis. It has Speedwave corrugated topsheet for improved tensional rigidity and it features the top-of-the-line Fusion binding system. Unfortunately it?s a bit wasted on me. The ski is too short in the 168cm size and the 176cm was not available. It skied well, was probably as good as or better than the other skis tried here. But size is critical and 168cm is too short for any use. Another top end ski for carving thrills, but too short a size for my use. The Crimson was the last ski I would try, after 12 hours of testing over two days, I was no longer in top form and was wondering if I was being as rigorous as earlier. Well, this ski got my attention and provided the hottest laps and the greatest wow factor when compared to the other wide skis. The ski has very reliable turn-in and edge-grip. It was light and capable of a wide range of turn shapes. But it was very stable and with a 20 mph tail wind I was plunging down the mountain at highway speeds. The ski provided hero performance on the groomed and would probably provoke some insane mogul and off-piste skiing as well. A good western skier could use this as a carver in a two ski quiver. An east-coast skier could use this as a one ski quiver for all conditions. Atomic has hit a home run with this ski. The Nomad Crimson is a great ride that will change what and how good skiers ski. Telepathic responsiveness and a wide performance window add up to unforgettable skiing. Ok Michael...you had way too much fun all by yourself. Nice job...kudo's! Can't wait to get my Watea 84 on the snow. So....are you running out to buy something new for the boat? Actually, the demo event makes me want to reduce my quiver by selling 3 or more skis. I'll take two of these 3 out west, Contact 11, Monster 82 & AK Rocket. The XXL is too big and the Spats are too specialized. I really should sell these two. In Vermont I would be all set with the Monster 82 and one of the race skis. I'll be selling the XXL, Spats & the Elan Speedwave 14. Overly specialized skis are not needed and too much hassle to haul. I think you & Ron will be very happy with your Watea's & Jim will like his i78M's. thanks Bud, It sounds like you guys had a great time and you know how much I wol dhave loved to demo all those skis. I can't wait to get on my 94's now. Great write up and sounds like there are a lot of really good skis out there. Michael...sounds like you're making some wise choices in sliming down your harem..
Glad you confirmed my expectations of the Wateas! I'll be scanning the conditions reports and weather reports (and I'll be hoping for snow)! Great reviews.? What you described in the iM78 will make me very happy. ?I'll be glad to have you try my 177's and see what you think relative to the 171's. May i cut and paste your reviews into the appropriate Manufacturer? ski review sections below when I get back from Thanksgiving so people can find them throughout the year?? Or maybe I can just create a link to this review. I'll be placing the reviews later today. I think the longer size i78M will be ideal for you now that I have demod the ski. Michael, having owned and skied my IM82 on groomed, high speed, slow speed, bumps and boot high, I got a good feel for the ski and enjoyed it's strenghts and adjusted for it's one weakness....hardpac k.
SInce I have not skied the 84 Watea...can you recollect any significant differences? I'm aniticipating the 84 will arc easier, float a bit better, release from turns easier....the turning radius is about the same on both. Boilerplate....like the blue ice variety we get in the east...it's slip and slide time. I've used the Monster 88 on packed-powder and crud, so I've never felt a lack of edge-grip. Bullet-proof ice is difficult for all skis IMO. I would say the Watea provides about 90% of the edge-grip of the RX8. The construction & feel is very similar. Keep in mind that the Watea is a new model and Fischer may have found some enhancements since the RX series originated. This should compensate for the added width of these models. It's safe to think of the Watea as a wider RX ski. Oh I think you just made his day!